SACRAMENTO, CA / ACCESSWIRE /September 12, 2018 / Today, Trifecta (https://www.trifectanutrition.com/), the nation’s largest all organic meal delivery service, and Official Meal Delivery partner of the UFC, is announcing the kick-off of their Golden Ticket Sweepstakes. 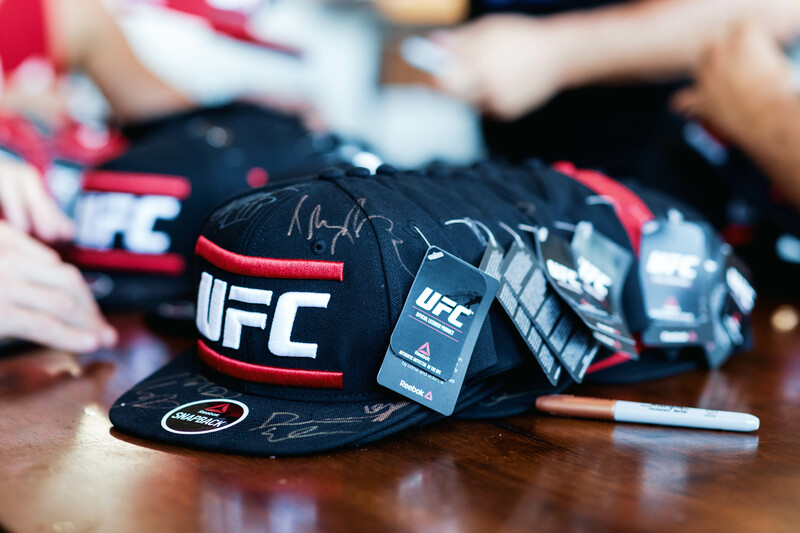 Running from September 11th through September 16th, the first 250 orders placed online with Trifecta (https://www.trifectanutrition.com/khabib-vs-mcgregor) will receive a signed UFC hat by Team Alpha Male. 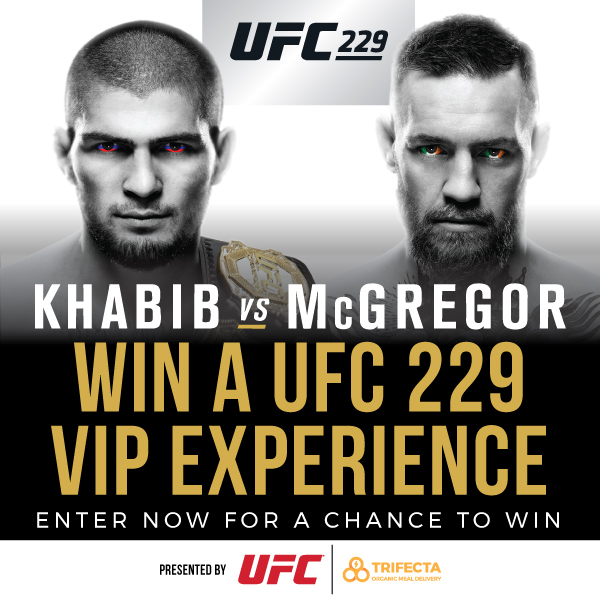 One lucky winner will receive the Golden Ticket and win a trip for two people to watch UFC 229 Khabib vs. McGregor. As part of the Golden Ticket Sweepstakes, the winner will have their roundtrip airfare and hotel (plus a guest) paid for and receive two complimentary tickets for Khabib vs. McGregor. In addition to this, the winner will get the full VIP experience by having the opportunity to hang out ringside with UFC Hall of Famer, and Trifecta Partner, Urijah Faber, along with other UFC fighters in attendance. The winner will be announced on September 24th. Hall of Famer and Investor in Trifecta. "I will be there personally to give the winners a break down on how I think the fight will play out and to really make this a VIP experience!" One of the most anticipated fights in UFC history, UFC 229 Khabib vs. McGregor will take place in Las Vegas on Saturday, October 6. "The Notorious" Conor McGregor is returning in an attempt to retake the UFC lightweight title from unbeaten champion Khabib Nurmagomedov in the main event of UFC 229. At 26-0, Russia's Nurmagomedov has been untouchable as a pro. His recent wins against Michael Johnson, Edson Barboza, and Al Iaquinta have only strengthened his place as one of the greatest lightweights of all-time. But Ireland's McGregor, the first man to hold two UFC titles simultaneously, has made a career of achieving what some say is impossible. He plans on putting a "1" in Nurmagomedov's loss column while taking back the belt he never lost in the Octagon. "Conor McGregor has turned himself in the face of the fight game and is now the most popular fighter of all time. Trifecta and the UFC are thrilled to have teamed up again to bring two lucky fans the experience of a lifetime to watch what will probably be the greatest MMA fight in the history of the sport," added Greg Connolly, CEO at Trifecta. "Never before have two so talented, so famous, and so notorious fighters gotten together to put on an amazing show – we are excited to send two lucky winners to this once in a lifetime experience for free!" Under the groundbreaking new agreement with the UFC announced just last month, Trifecta became the UFC's first-ever Official Meal Delivery Partner, creating a brand-new sponsorship category for UFC. In return, Trifecta will have a branded presence at the UFC Performance Institute®, the state-of-the-art athlete training facility in Las Vegas, and an activation presence at UFC’s live events. UFC and Trifecta will also collaborate on a co-branded video series and social media campaigns, and Trifecta will utilize UFC branding to create custom delivery boxes and to promote national sweepstakes for UFC events. In addition to UFC bantamweight champion Cody Garbrandt and Trifecta brand ambassador, Trifecta boasts an impressive roster of athletes and celebrities such as "Fittest Man on Earth" Rich Froning, actor Liam Hemsworth, Wonder Woman/Justice League actor and CrossFit star Brooke Ence, and Detroit Lions tight end Luke Willson, along with more than 130 additional NFL players, celebrities and celebrity athletes. For more Information on the Golden Ticket Giveaway, visit https://www.trifectanutrition.com/khabib-vs-mcgregor. NO PURCHASE NECESSARY – see Official Rules for details. Trifecta is the nation's largest all-organic meal delivery service founded with a bold mission – to get America back into shape. Eliminating shopping, cooking and cleaning by delivering fully cooked meals directly to customers' doors in all 50 states, Trifecta's food is the highest quality in the industry and uses 100% USDA Organic, Gluten, Dairy and Soy-Free ingredients that are never frozen, and Wild Caught/Grass Fed. All their food arrives in a refrigerated case, vacuum sealed and ready to eat. Trifecta offers meals in four categories to meet everyone's needs including Paleo, Vegan, Clean Eating and Classic Meal and an A La Carte section that operates more like an online grocery store deli. Trifecta is a Title Sponsor of Team USA Weightlifting and the CrossFit Games, teaming up with CrossFit, Inc. to combat chronic disease. Their app "Trifecta – Fitness, Nutrition and Tracking" is the first time an all-in-one solution for people to track their food and performance right from their smartphones utilizing Trifecta's food database 5+ million food items. For more information on Trifecta, visit trifectanutrition.com, download their nutrition app at www.trifectanutrition.com/app and follow them at facebook.com/trifecta meals, @trifectasystem on Instagram and Twitter, or subscribe to them on YouTube at http://www.youtube.com/c/TrifectaNutrition.